Rafael Salamanca, Jr., joined the Council by special election in 2016. Thanks to quirks in the political calendar, he has already faced four elections since then, and won each one handily. The squat, triangular building at the corner of Westchester Road and Southern Boulevard is not a thing of beauty. It is a one-story brick structure with few windows that sits in the shadow of the elevated 2 and 5 train. But it is where Rafael Salamanca, Jr., has spent much of his life. He used to play in the basement where his mother worked for a healthcare company. Later Salamanca, who dropped out of high school but attained his GED and eventually an associate’s degree, worked for the same outfit, in the same basement. Now his office as the City Councilmember for the Bronx’s 17th district occupies most of the first floor. Soon, the building will be demolished in an example of the changing real-estate market in the Bronx, which is a force that Salamanca will be positioned to shape as the new chairman of the Council’s powerful Land Use Committee. That gavel is always considered a plum because the Council’s land-use powers are its most powerful policy tool. The city’s legislature has the power to approve the sale or acquisition of city property and to change the zoning map that governs the private real-estate market. The mayor can veto those moves, but the Council can override the mayor. Unlike the budget, where the Council can’t really force the mayor to spend money, or lawmaking, where its authority is limited by mayoral prerogative and state power, the Council has the last word on land. That’s real juice. Over the next four years, the spotlight on Land Use is likely to be especially intense. At least five of Mayor de Blasio’s proposed neighborhoods rezonings—the heart of his affordable housing plan, which he recently expanded to a goal of 300,000 units—remain to be done. The discussion about closing the jails on Rikers Island will increasingly revolve around the question of where to put replacement facilities. De Blasio’s effort to tackle the homelessness epidemic by constructing 90 new shelters will trigger controversies in dozens of neighborhoods, inevitably creating opportunities for the Council to play a role. 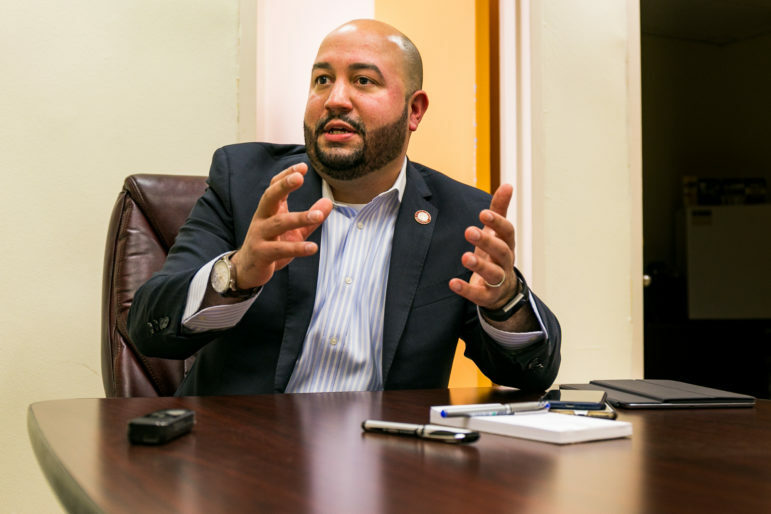 No member except for Speaker Corey Johnson will do more to shape that role than Salamanca, who takes the powerful post despite being a relatively junior member of the Council. Because Salamanca joined the body by special election in 2016, the only Council members with less seniority are the 11 members first elected last November. 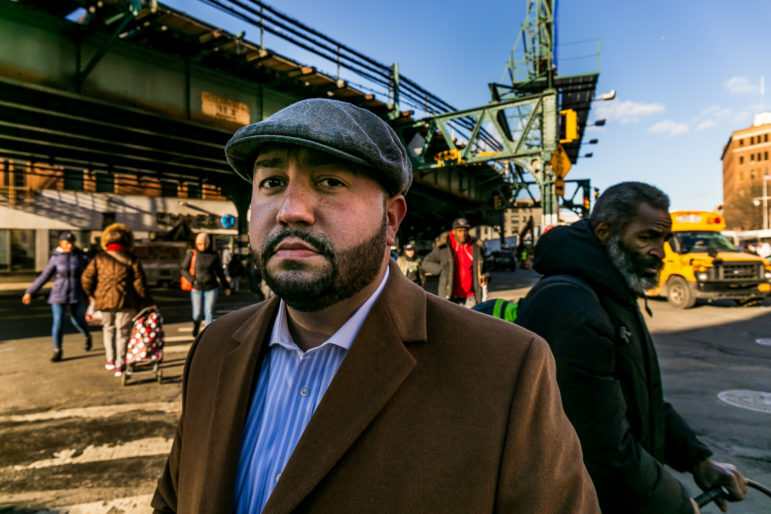 But Salamanca’s experience is deeper than that: he was a community-board member, and then a district manager of Bronx Board 2 for five and a half years. “I think that gave me firsthand experience on how to deal with developers on a very grassroots level in terms of what the asks are,” he tells City Limits. After joining the Council and dealing with more than one land-use application in his first months—he has handled seven in his short time on the Council—Salamanca asked Speaker Melissa Mark-Viverito to name him to the vacant chair of the land-use subcommittee overseeing planning, dispositions and concessions, and she did so. That job “gave me a broad understanding of the different type of issues that are affecting different communities,” he says. His approach to development is reflected in two major developments approved in his district during the last Council. One is La Central, a 992-unit, five-building complex in which every unit will be income targeted—a.k.a., “affordable”—with some aimed at very low incomes, like $23,310 for a family of three. On the other side of the spectrum are affordable units for more affluent people. Same goes for Bronx Commons, a mixed-use development with 305 apartments reserved for families making $22,000 to $89,000. The median income in Bronx community districts 1 and 2, which form the bulk of Salamanca’s district, is $24,670, and the poverty rate there is 40 percent. Salamanca’s support for development—albeit qualified—has earned him criticism from advocates who feel that rezoning and development on any scale will almost certainly gentrify the Bronx and trigger displacement. These conflicting opinions are likely to clash if the city moves ahead with a rezoning in the Southern Boulevard area, where the Department of City Planning is currently conducting a neighborhood study. “What I’m taking out of this study is that we’re going to be able to identify areas that have been forgotten for many years. We’re going to be able to identify needs of the community,” Salamanca says. Salamanca says he feels the city needs to be more aggressive at surveying people in the neighborhood to get a sense of what they want the future to look like. In other neighborhoods where a rezoning has been contemplated or passed, there have been significant levels of worry that—in spite of whatever steps the city takes to try to ensure affordability—increasing density will invite market-rate housing that triggers displacement. Two of the de Blasio rezonings are already undergoing public review: Jerome Avenue in the Bronx is nearing a final vote, while Inwood in Manhattan has just begun the process. 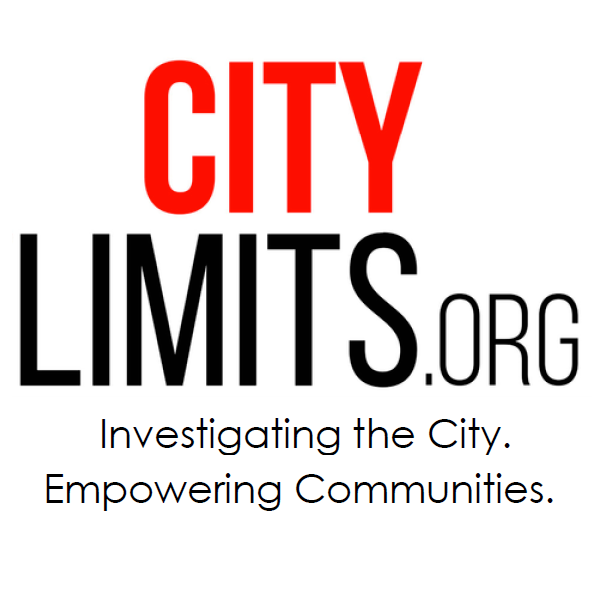 As far as the future of the other neighborhoods that could see a rezoning—Bay Street in Staten Island, Long Island City in Queens, and Bushwick and Gowanus in Brooklyn—Salamanca told City Limits he was unsure when those projects would begin the seven month Uniform Land-Use Review Procedure or ULURP, the public review process that culminates in a Council vote. For all the prestige of the Land-Use chairmanship, Salamanca will not wield absolute authority. Johnson has the power to set the stage and the Council’s professional land-use staff have great influence as well. The question is what happens if the local Councilmember decides the deal isn’t good enough. The extent to which individual members have the power to scuttle projects in their districts is not fixed by law—it’s a fluid aspect of Council culture. Mark-Viverito was criticized as she left office for allowing Councilmembers a lot of sway over proposals affecting their neighborhoods. Salamanca indicates that he supports deferring to the local member on whether to pass or kill a rezoning proposal, so long as that member articulates a rationale for why they feel that way. The chairman also says he supports giving community boards more power, but didn’t have specific ideas for how to do so. A primary concern for Salamanca is whether the city is moving toward a fairer distribution of social-service infrastructure. He says he has “close to 30 shelters in my district” and that he has secured “a verbal commitment from [the de Blasio administration] that they’re not going to open up any more shelters in my district.” He insists he’s not “anti-shelter” but argues that in Bronx community district 6, only 600 of the 1,200 people living in shelters are from that community district. “And so fair share, in terms of doing their part, is something that falls in line in my committee.” This same argument drives his opposition to opening up a jail in his district to help replace Rikers: His district has long hosted a Correction Department jail barge and a youth detention facility. “We’ve taken other communities buildings for far too long and it’s time for our community, to revitalize our communities,” Salamanca says. “That’s why right now I’m a ‘no’ — unless the mayor’s office comes with this overwhelming plan. Salamanca joined the body by special election in 2016 after Maria del Carmen Arroyo left her post, getting 39 percent of the vote in a six-person field. Thanks to quirks in the political calendar, he has already faced four elections since then, and won each one handily. He raised nine times as much as the combined fundraising haul of the eight people who mounted some sort of challenge to him in 2017, and was among the top fundraisers citywide. Only about a sixth of his donations came from the Bronx. Unions are among his big givers, as are real-estate law firms and developers. Steven Roth of the Vornado Trust wrote a check to Salamanca for the maximum amount 23 days after the election ended. The PAC run by the trade association for property owners, the Rent Stabilization Association sent him $2,250. Salamanca says that by staying as close as he has to his roots, he has a sense of the different needs affecting his district. He has friends who never received much education and need low-income housing. He has friends who went to school, came back and are earning $90,000 or $100,000 grand. They want to stay. How do you create space for all of them? Salamanca outside his Bronx office. Salamanca's support for development—albeit qualified—has earned him criticism from advocates who feel that rezoning and development on any scale will almost certainly gentrify the Bronx and trigger displacement. This is the problem with term limits. Under the old system a more experienced councilmember would most likely be land use chair. I can’t believe he’s complaining that developers want to, and are, building market-rate in the Bronx. I doubt mixed-income developments will be successful. Market rate renters aren’t going to pay market rents to live in the same building as the poor. Not PC but true. Actually, it happens all the time. Ugh. This is the same real-state-funded politician who defunded local nonprofit housing organizations as a political vendetta. The proposed Inwood rezoning has officially entered the seven-month public review process known as the Uniform Land Use Review Procedure (ULURP) through which a rezoning is approved or disapproved. Read our free newsletter about the proposal and the review process, in English and Spanish. Inwood es el quinto vecindario a rezonificar que pasa al ULURP bajo el plan de vivienda asequible de la administración De Blasio. La propuesta surgió de la visión del concejal local Ydanis Rodríguez de desarrollar el lado este de la Décima Avenida en Inwood y crear un centro de tecnología y servicios de salud. Residents will have a final chance to weigh in on the proposal at a hearing on Wednesday.